1) This paper was originally prepared for and presented at the 6th FIG Regional Conference in San José, Costa Rica 12-15 November 2007. Key words: Pictometry, oblique images, photogrammetry, cadastre and land registration, topographic mapping. 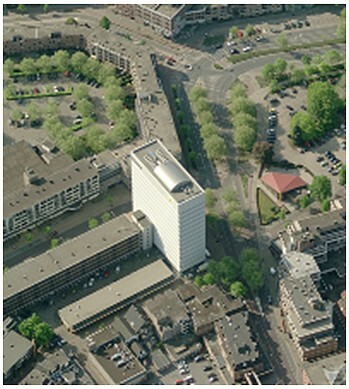 The Netherlands' Cadastre, Land Registry and Mapping Agency (Kadaster) performed a research to the potentials of the Pictometry technology for cadastral purposes in close co-operation with the GeoTexs company from Delft, The Netherlands and Blom Info, Copenhagen, Denmark, part of the Blom Group. Blom Group has an exclusive license to apply Pictometry technology in Europe. Data capturing with this technology will be executed for all 50.000+ inhabitants cities in Europe. The patented technology allows users to easily and efficiently view and measure in ortho images and oblique images and enables creation of a much richer database of the real world while the images can be processed in existing GIS environments. In the research Pictometry images were used captured in 2006 and covering the entire territory of Apeldoorn municipality, The Netherlands. 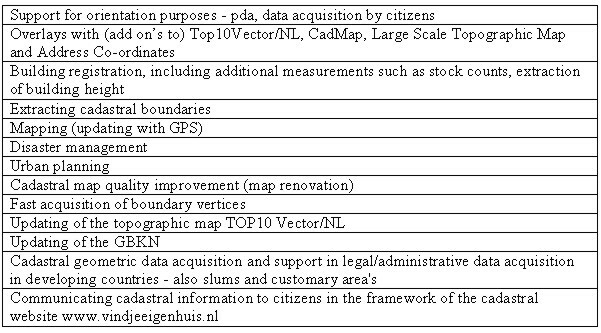 The map data consists of: (1) boundary lines of objects of Top10Vector and Top25 Raster, (2) feature lines of the Large Scale Base Map of the Netherlands (GBKN) and (3) cadastral map. Our tests reveal that the accuracy of taking location measurements in ortho-images is 19cm and in ortho-images 86cm, expressed in terms of root mean square error. The accuracy of the elevation component depends on the accuracy of the underlying DEM. Although Pictometry technology has been announced as a visualisation tool, not as a surveying tool, the above measures demonstrate that photogrammetric surveying accuracy can be achieved. 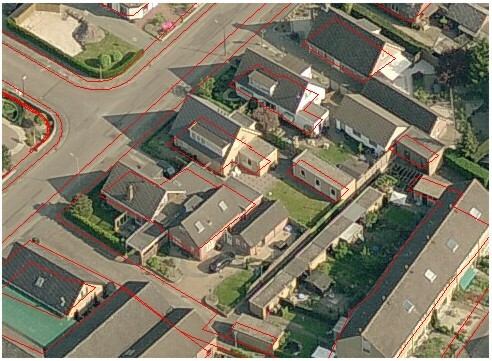 Within a cadastral context Pictometry may serve as aid in splitting parcels and carry out parcel formation. Furthermore, it appears to be a suitable tool for (1) preliminary boundary determination via notary, (2) building registration and (3) communication from government to citizen. Pictometry is an aerial image acquisition and data processing technology developed and patented by US-based Pictometry International Corp, headquartered in Rochester, New York. The essential difference with conventional airborne photogrammetry is that in addition to vertical also oblique images are taken, which is enabled by a sensor system consisting of five cameras, one directed nadir (image plane approximately parallel to terrain), the others viewing forward, backward, left and right (Figure 1). The viewing angle for all sideward looking cameras is approximately 40 degrees off-nadir (Figure 2). The (mutual) geometry of the five cameras is accurately calibrated, potentially providing, in conjunction with today’s advanced computer technology many new application prospects. The dynamic range of the grey values is 12 bits enabling to carry out surveys under unfavourable light conditions. The present standard approach stems from US homeland security purposes and includes a flying height for neighbouring images of 3,000 feet (1,000m) and for community images 6,000 feet (2,000m) and pixel size 6 inches (15cm) and 1 foot (30cm), respectively. In oblique images the pixel size varies from 10cm at the bottom to 18cm at the top of the image. The standard products acquired by Blom Group of Europe are usually neighbourhood images. Up to 16 square kilometre can be acquired per hour and every 1.5 seconds photos are taken. Each image consists of 6MB of data while each square kilometre is covered by around 50 views, that is around 310mb of data. Each point on the ground is visible in up to 18 oblique images, provided absence of occlusion (point is not visible because it is concealed by another object in the line of view). Direct geo-referencing is enabled through the onboard, integrated GPS and Inertial Navigations Systems (Applanix, a subsidiary of Trimble). Figure 1. The Pictometry camera sensor systems consists of five cameras, one directed nadir, the others viewing forward, backward, left and right (Image Courtesy: Blom Group). In the standard approach, vertical images have a 30% along track overlap. This is sufficient to ensure that no gaps occur due to unplanned movements of the airplane but not enough to allow stereo-viewing and mapping. As from October 2006 onwards, Blom Group has modified the standard approach to 60% along track overlap, which allows for stereo viewing. To create orthoimages from non-stereo vertical views a Digital Elevation Model (DEM) is required. In the Netherlands the existing AHN (Actuele Hoogtebestand Nederland) is used. In the case of stereo-images, DEMs can be semi-automatically extracted from the overlapping images, using image matching techniques. Pictometry images are provided as an integrated library to be used with the Electronic Field Study (EFS), which is software to view and measure both ortho and oblique images and to navigate and find a required location. The ongoing Pictometry project, currently the largest image-acquisition project in Europe, aims at creating a standard database of oblique and ortho-aerial imagery covering every town in Europe with more than 50,000 inhabitants, a total of over nine hundred towns, the first and main customer is Microsoft. By the end of September tens of cities in the Netherlands are already available (http://maps.live.com; http://local.live.com). An interesting feature of the business model is that, anticipating growing interest in geo-information on the part of non-conventional users and partly induced by the success of Google Earth, Blom first acquires the images and then approaches potential customers. Anyone can then take out a licence to use the standard image library for a price per square kilometre. The standard list price is presently Euro 250/km2 annually but depends on, amongst others, volume ordered and time span of subscription. Image acquisition without ordering at forehand is a business model gaining popularity; for example, Cyclomedia, which captures terrestrial photographs from a car platform, has also adopted this capture-prior-to-order model. And of course, this model already exists for decades for Earth observation from satellites. Figure 2. Oblique view from the North on main building of Kadaster in Apeldoorn. Although a recent technology, Pictometry has already attracted the attention of several cadastral institutes in Europe. The Spanish cadastre has started a project in which they use Pictometry ortho images for detecting illegal buildings along the Mediterranean coast as an aid to monitoring urban growth. Spain has a good mapping record: 40% of urban areas are on scale 1:1,000. No use is made of a standard product, but the images are acquired in dedicated surveys. The ortho images have a Ground Sampling Distance (GSD) of 10cm. Also the Danish Cadastre (KMS) has shown interest in Pictometry. IGN France and Ordnance Survey in England are resellers of the product. One may ask what does Pictometry technology add to traditional aerial photogrammetry? In principle just oblique images are added, and there is nothing new about that. 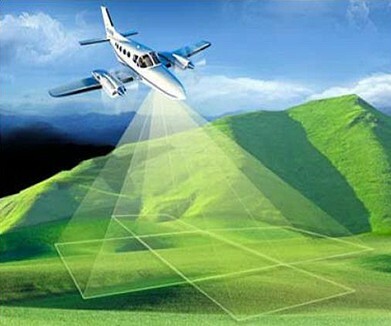 In the past the process of extracting accurate geometric information from aerial images was restricted technologically and could only be done on a production scale by using vertical images. Much emphasis was on using vertical images measuring stereoscopically and the whole image acquisition and measuring process was adapted to this. Compared to carry out measurements in mono nadir images, measuring in stereo images brings the following advantages: (1) acquisition of 3D coordinates without support of a Digital Elevation Model, (2) better interpretation, (3) higher precision is achievable because points can be better identified. Today the geometry of the sensors can be calibrated accurately, direct geo-referencing can be done through GPS and inertial navigation systems while complex geometric transformations can be carried by computer and additional information sources, in particular high resolution, accurate DEMs, can be easily incorporated by computational means. As a result, extraction of relatively accurate geometric information from oblique images is now possible. The biggest advantage of oblique images compared to vertical images is better and more intuitive interpretation. Interpretation of vertical images requires training and craftsmanship while the interpretation and taking measurements in oblique images can be done after a short training. This statement has been confirmed in our tests. Oblique images make aerial information thus accessible to a large, non-professional user group, such as officers at municipalities to support their actual tasks. Measurements which can be carried out on the oblique images include height, distance, area, location and elevation. Volume of, for example, buildings although in principle possible, can not yet be determined by the EFS software. Both the ability to observe the environment from an oblique viewpoint and the ability to take measurements provides many new applications for a variety of user groups. Table 1 provides a non-limited list of possible applications within the context of Kadaster. What does a license for using Pictometry products, which is rather expensive, add to using the same images available at Microsoft’s local.live.com website for free? Actually, the two scenarios are not comparable at all. First of all, the availability of images and areas are completely determined by Microsoft; images may be available but not yet included on the website. Furthermore, and more importantly only the oblique images are available, not the ortho-images with as consequence that no stereo-images will be available. Another major drawback is that users are not enabled to carry out measures on the images and to use them as a navigation tool for example to access other data sets. In short: Microsoft’s website local.live.com enables just viewing of weakly geo-referenced oblique images. Figure 3. Cadastral map (black lines) superimposed on Pictometry ortho-image. To answer research question 1 (estimation of the accuracy) a comprehensive test was conducted by creating a test field of single points around the Kadaster building of which the x,y coordinates were determined by high-end GPS measurements. Well-identifiable points in particular corners of white roads signs which contrast much with the dark colour of the street asphalt were selected. As a measure of accuracy the root mean square error (RMSE) of the x and y coordinates were determined (Table 1). Table 1. Accuracy assessment of Ortho- and Oblique images. To determine the variability of measuring in different oblique images, all GPS points visible in all oblique images were measured; one to six measurements of the same point were carried out, depending on the visibility and identifiably of the points in the diverse oblique images. For 31 points two or more measurements could be carried out; the average values and other statistics are shown in Table 2. Table 2, Statistics of measuring identical points in different oblique images. The achievable accuracy of the elevation component (elevation; research question 2) depends on the accuracy of the underlying DEM. Figure 4. 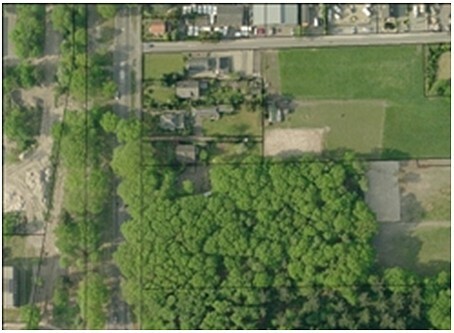 Left, Oblique image enables to recognize that the trees are located at the left side of the ditch. Right, Oblique image showing a corridor connecting two buildings, hanging free in space. In general mono images lose an important visual clue (depth) compared to stereo images. Absence of the stereo component is, as earlier stated, not a characteristic of the Pictometry technology itself, but of the standard products delivered. Figure 5. Projection of GBKN lines into oblique image. Direct mapping of features and their attributes on colour images is not feasible, because attributes are assigned to features in the form of colour codes which are difficult to observe on colour images. Furthermore, black/white images do have a better contrast. Parts of the above shortcomings in functionality may be resolved by plugging EFS into GIS packages such as Geomedia and ArcGIS, for which plug-ins have been developed. Such plugs-in were not used in our tests. As an additional information for the surveyor while being in the terrain for retrieving the location of pipelines, sewerages, telephone line and other utilities. Using the ortho images as a backdrop, the GBKN and the utility map can be superimposed on the images. Since the different data sets can be merged with high accuracy, measures can be derived such as the distance from a road edge visible on the ortho image and an utility line element visible in the map. 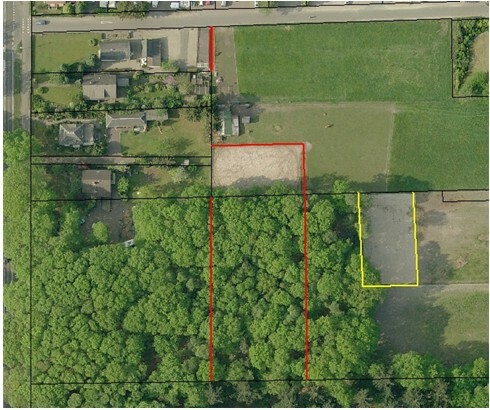 When a party buys a part of an existing cadastral parcel, the parcel has to be split into two entities and the boundary between these entities measured. How can Pictometry technology support this process? After signing the transaction act at the notary, the splitting of parcels is usually down in two stages. First the buyer and seller carry out boundary addressing in the presence of a cadastral land surveyor. Next the surveyor measures the boundary in the terrain. Sometimes both actions are carried out simultaneously; immediately after boundary addressing the surveyor measures the boundary, but there might also be a (large) time delay between both. Furthermore, boundary addressing is usually not carried out immediately after signing of the transaction act at the notary, there is a time delay which may appear too long for some parties. Therefore, these parties will carry out boundary splitting prior to going to the notary. In 2006 the cadastre processed 85,000 transaction acts in which a part of a parcel was delivered to a buyer, thus requiring parcel splitting; 25,000 of these were split prior to establishing the notary act; that means about 30% of splitting is subject to prior land surveying of the boundary. The situation in The Netherlands is quite exceptional. In the most countries splitting of the parcel has to take place before the transaction act. Reconstruction of the boundaries between properties sufficiently accurate, sufficient often meaning in practice at the centimetre level. Given the accuracy level determined within the accuracy tests described above, Pictometry technology will be unable to serve that aim. Although Pictometry technology is not suited for the last task, it may serve the first task as an aid in splitting parcels and parcel formation by preliminary boundary determination. The reason for prior splitting is usually not to arrive at an accurate boundary description, but to establish the new parcels immediately after passing the notary act. So, the time delay between passing of the transaction act and parcel formation is crucial because it is often undesirable. Furthermore, the separation of boundary addressing and actual boundary measurement is experienced by many as annoying. Given the above practices it would be beneficial when a system would be at hand which enables to carry out boundary addressing and subsequent parcel formation directly at the notary during and as an integral part of the transaction ceremony. Our tests demonstrate that such a procedure could be based on Pictometry technology (Figure 6). Figure 6. Identification of preliminary boundaries (red and yellow) in Pictometry ortho-image. The cost considerations are of a general nature, because the research did not intend to incorporate Pictometry technology as a replacement in an existing production process. Suppose for comparison purposes that the whole of the Netherlands would be flown once in every two years, which is presently the standard schedule for updating TOP10 by TD Kadaster and that the standard list price has to be paid to acquire the images: 250 euro per square kilometre per annum. The land area of the Netherlands is around 35,000 square kilometres. So, the entire territory of the Netherlands can be captured for a cost of Euro 8.75 million per annum. When we restrict cost calculations to the major cities (50,000+ inhabitants), which is the present standard approach, just 4,300 square kilometres have to be captured resulting in a total investment of around Euro 1 Million per annum. The Topographic Survey out-sources the aerial surveys necessary to capture the entire territory of the Netherlands by photographs for Topographic Map updating. The costs are around Euro one million for capturing the whole territory of the Netherlands at a resolution which is, more than two times less than Pictometry images (36cm versus 15cm), while the flying height is three times less (3km versus 1km). For that amount the Topographic survey receives stereo film images (black/white or colour) at scale 1:18,000 which are scanned with a GSD of 36cm. In recent contracts the images may also be acquired directly in digital format in colour with a GSD of 27cm. Pictometry technology is a very promising technology when viewed from the broader perspective of the ambitions of Kadaster. The costs of Pictometry technology for covering the urban areas in the Netherlands (50,000+ inhabitants) is Euro 1Million on an annual basis. As a result Pictometry technology can be beneficially and cost-effectively applied when it serves several (future) tasks of Kadaster and in a broader perspective the geo-information needs of the whole of the Netherlands. More importantly, Pictometry technology might serve as an engine and catalyser to fulfil the ambitions of Kadaster to become the principal supplier of real estate and geo-information within the Netherlands. The opportunities offered by this emerging technology should be particularly valued from that perspective. They have been chosen because they are new or rather new for Kadaster, while they fit within the ambitions of Kadaster and have a high degree of actuality. The anticipated results of the first pilot are: (1) better spatial orientation for all parties during transaction, including buyer, seller and notary, (2) in many cases – say 50% - no identification in the field will be required anymore, releasing buyer, seller and surveyor, (3) the splitting and creation of the new parcels can be realized immediately after passing of the act, (4), the cadastral map and graphical indication of the new boundary superimposed on the Pictometry image forms a new template for the surveyor, which can be used prior to and during measurement in the terrain, and (5) an overview of cost savings to be gained. The anticipated results of the second pilot – building registration – include: (1) understanding of the information required in the building register, (2) insight in which of the required information can be extracted from Pictometry technology, (3) development of a prototype to use Pictometry technology as a navigation tool to access other (geo-spatial) databases, (4) definition of the concerning work processes and (5) an overview of the costs involved. The anticipated results of the third pilot include: (1) easier access to data, such as BAG and WOZ data, over the internet, (2) level of appreciation by customers, (3) overview of potential products to be delivered over the internet and applications. Mathias Lemmens. Dr. Mathias Lemmens holds a post at Delft University of Technology, The Netherlands and operates, being principal of the firm GeoTexs, as an international consultant and technical advisor specially focused on emerging and developing countries and specialised in the fields of remote sensing, photogrammetry, Lidar and GIS. Geodesist by training, he has over twenty-five year's research, lecturing and advisory experience. He has published over 300 articles and a state-of-the-art book on Geoinformation Technology. He also serves as editor-in-chief of GIM International. Christiaan Lemmen, geodesist, graduated at the Delft university of technology. He spent the 25 years before joining Kadaster International in 2002 in information system design and development for cadastral mapping, topographic mapping and land development. He is part time associate professor at the International Institute of Geoinformation Science and Earth Observation (ITC). Within FIG he holds the position of chairman of a working group on pro poor land management. He is a contributing editor of GIM International. Martin Wubbe is within Kadaster International responsible for the region Central and Latin America. He is a Delft-university graduated geodesist who has about 25 years experience in managing substantial projects for cadastral mapping, topographic mapping and land development. He spent quite some years as project manager in the America's. The last ten years, before joining Kadaster International in 2004 as a full staff member, he was responsible for land development projects in the whole western part of the country.